After spending 3-1/2 hours enduring the long lines, surly clerks, and insane regulations at the department of motor vehicles, I stopped at a toy store to pick up a gift for my son. I brought my selection - a baseball bat - to the cash register. "Cash or charge?" the clerk asked. 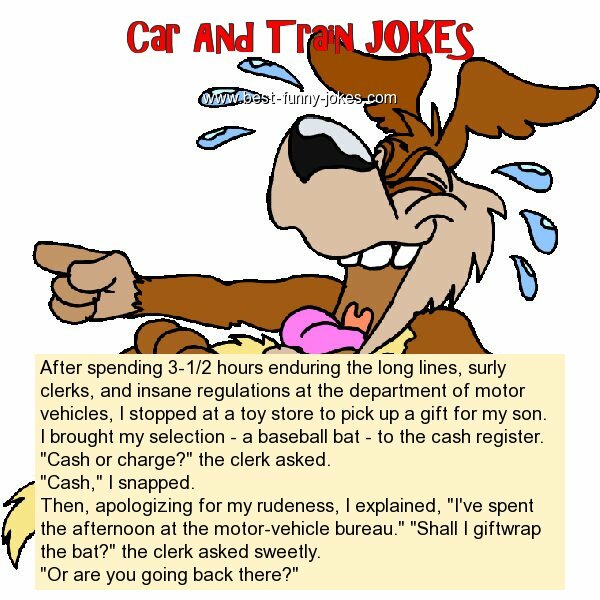 Then, apologizing for my rudeness, I explained, "I've spent the afternoon at the motor-vehicle bureau." "Shall I giftwrap the bat?" the clerk asked sweetly. "Or are you going back there?"